There is near-universal agreement: Tack must be cleaned -- ideally after every ride. Not many people do it, but everyone agrees they should. When and if you're going to do it, do it right. Good old basic saddle soap is the first step in having healthy leather. "Get a bar of saddle soap or a liquid cleanser to clean out the pores," advises Moses Smucker of Smucker's Harness Shop in Pennsylvania's Amish country. "The most important part of tack care is getting the dirt out of the leather pores. You need to make sure that leather is clean. That's going to take elbow grease, but the more you work with the leather, the more beautiful it gets." Saddlemaker Don Butler, owner of the Custom Cowboy Shop in Sheridan, Wyo, agrees. "You need to use a saddle soap to clean the leather. I find it's best to use a damp sponge -- or a knuckle brush if it's really dirty -- with the soap. You want to soap up one area of the tack, then wipe it clean with a sponge. As long as the soap suds keep turning gray, you need to keep cleaning." Smucker says cleaning new leather is important because the saddle soap will put oil back into the leather. "Conditioning is only necessary if your leather is 'thirsty,'" says Smucker. "You certainly don't want to over-condition your tack to the point that it feels too oily." The harness maker says water won't hurt leather. "Water and leather aren't enemies -- in fact, water is used when tanning leather. But again, you'll need to clean and condition your leather after it gets wet to make sure that oils are put back in." Butler suggests letting the saddle dry, but only partially, before oiling it. "If it dries out completely after you soap it, that leather will feel like a board. When it's almost dry, put oil on it. If you have any parts that are touching the horse's hide, use a greasy type of saddle dressing on those. Mildew is harmless, and is actually a sign of healthy leather. Use your oil sparingly," Butler cautions. Too much oil will attract dirt and grime. "And if you're conditioning something like leather chaps or boots, don't use oil; use a conditioner." This saddlemaker puts three light to medium coats of oil on new leather. A used saddle gets "one good coat of oil and one light one." After oiling or conditioning, he gives a light buff with a soft cloth to remove any excess. Will cold weather, mildew or dust harm leather? "Not at all," Smucker says. "In fact, mildew is the sign of healthy leather; it shows there are sufficient oils. Dust doesn't hurt the leather, but just makes your tack look bad." Mildew and dust may be wiped off with a soft cloth. Letting tack go for too long without cleaning and conditioning can result in drying out the leather and will eventually crack. Sometimes there's hope in restoring dry leather; sometimes there's not. Thin oils, such as Neatsfoot, can help restore old leather, but once leather is dry-rotted, it's not salvageable. Smucker notes that care should be taken if Neatsfoot oil is used on any leather. "It's a fine product, but the downside is that it will darken leather." There are conditioners and oils on the market that won't change the color of the leather. Butler explains that there are two types of Neatsfoot oil: one that's pure and animal-based, and one that's petroleum-based. "Only use the pure Neatsfoot oil, the animal-based product," he advises. "Petroleum-based products are not kind to leather. They'll rot linen stitching." Butler says that some saddlemakers will use olive oil, which does a commendable job. How often should you clean your tack? Rachael Horn, a 17-year-old active in the Casanova-Warrenton pony club in Virginia, cleans her tack after every ride. "I use either water or Lexol leather cleaner (you don't need to condition afterwards) on my bridle," she says, adding that she always takes her bit off because the leather tends to crack where the bit rests. She soaks the flash noseband and bit in water, "because the noseband gets so sweaty." "While that's soaking, I use a damp sponge and wipe off the buckle rests. Then I take my flash noseband, wipe it and use a leather dressing. 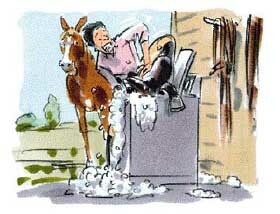 Be sure to dry the bit well before you put it back on the bridle." Horn oils her bridle only weekly, because "I don't want to oil it too much because I find it stretches." Horn doesn't clean her entire saddle every time she rides, but "I always wipe the panels. I don't oil the stirrup leathers, either. Oiling makes them stretch." The young equestrian advises wiping the stirrup irons after you ride to prevent rust. If she has old tack to recondition, she wipes off mildew, then soaks the leather in Clorox and water. "After that, I'll wipe it and use a conditioner again. I also use glycerin on old tack," she says. Horn suggests using glycerin on tack before a horse show. "It makes the tack look shiny and good." Other avid young tack cleaners are in the Kentucky Horse Park Mustang Troop. "Always remember to rub the conditioner in very well and be sure you condition around the buckles," Roshando Clark advises. "Wash the bit as soon as you take off the bridle." Clarissa Locke says that girths are often taken for granted but should be cleaned after each ride. "Always make sure your girth is clean," she says. "Be sure to clean off any hair or mud after you use it." It's also a good idea, notes Mustang Trooper Jeremy Bates, to brush off your saddle pad every time you use it. This will keep ground-in dirt from giving your horse saddle sores. Read the next horse tack article on Horse Riding Apparel.